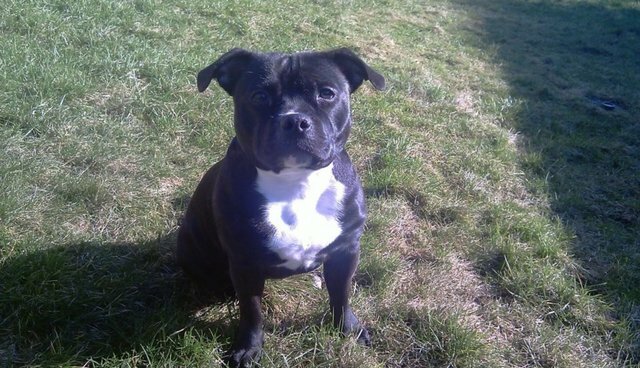 Maggie, a young Staffordshire bull terrier, was on her way to ring training with her owners when she stopped for a bathroom break. What began as a quick stop, though, turned into a full-on makeshift spa visit, as the staffie came across a large mud hole and hopped right in. As her owner, Lea Juhl Knudsen, writes on her Facebook page, there was no way to fight the overjoyed little dog as she frolicked and rolled in the mud. "I was just about to cry," Knudsen wrote. "But since it was too late to stop her ... I had to just laugh and [start] filming."